At 5.54 on the morning of Saturday 27 May 2006 the island of Java was rocked by an earthquake measuring 5.9 on the Richter Scale. During the weeks leading up to the earthquake, the local population had been living under the threat of a massive eruption from the local volcano, Mt. Merapi, to the north. No-one was expecting or prepared for a disaster striking from the south. Panic and confusion reigned. 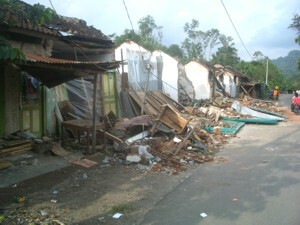 Many who were able to, raced north fearing another tsunami like the one that hit Aceh in December 2004. Some feared that Mt Merapi was erupting. Others believed that an ancient prophecy, which states that a giant earthquake will hit the area of Klaten, splitting the ancient kingdoms of Jogyakarta and Solo, was being fulfilled. In fact, the earthquake struck just offshore the southern coastline of Central Java, 20km south of the highly populated city of Jogyakarta. The city itself sustained minimal damage compared to the towns and villages to it's south and east, which in many areas suffered total destruction. Tremors were felt as far away as Semarang and Surabaya on the opposite coat of Java. 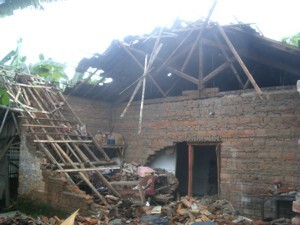 Yayasan Gunungan is located in Solo, approximately 55km to the east of Yogyakarta and 75km from the epicenter of the earthquake. It was still felt very strongly here, as if the solid ground was only a few feet deep, floating on a body of water rocking violently backward and forward. For a long time no-one knew exactly what had happened, until the news reports began to appear on television. As the day went on, the true extent of the disaster became more and more evident. The following morning, the officers of Yayasan Gunungan met to formulate a plan for providing emergency assistance to the victims of the earthquake. Steve would manage the operation, Pram would would co-ordinate assistance on the ground and Ratne would source supplies and control logistics in Solo. Directors and staff from a local company, Nova Furniture, began sourcing donations. The following few hours were spent buying supplies, arranging transport and organising volunteers. Later that afternoon, a truck, a pickup and a car, filled with food, shelter, medical supplies and 10 volunteer workers, from Yayasan Gunungan and Pramata Mulia University, left Solo not knowing quite what to expect. 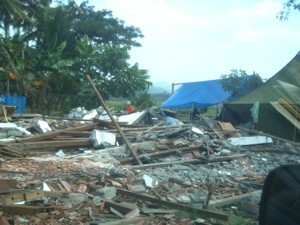 As the team drove towards the hardest hit area of Bantul, the number of collapsed houses visible at the side of the road began to increase. 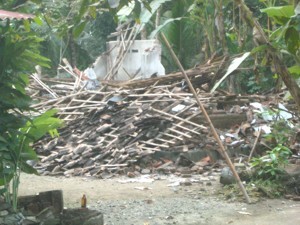 By the time the team entered the villages of Bantul, a house that was still standing became the exception. 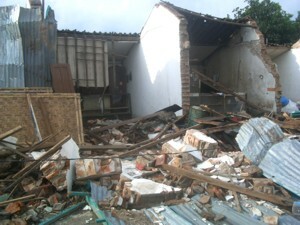 Rubble covered areas of road and parts of bridges had fallen away. 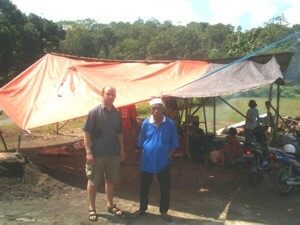 By early evening, the team pulled into the village of Bawuran in the district of Bantul. 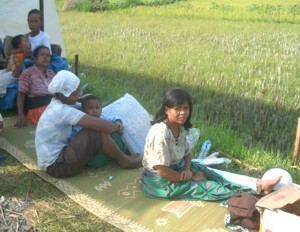 They were met by a number of local village Heads, who explained that the situation was bad. Villagers had evacuated to the surrounding fields and set up small camps, with the few provisions they had managed to rescue as they fled. Indonesia has two seasons, a wet one and a dry one. The rainy season is usually well finished by the end of May, but the team was told that there had been torrential rain the night before and the villagers had been sheltering under just a few plastic sheets which they had saved. As this was being explained, the rains started again and a thunderstorm then ensued. Nothing further could be done that night and the team continued to make plans with the village Heads well into the night. Early the following morning the team was ready to start distributing supplies. In co-operation with the village Heads, 5 camps in the immediate vicinity would be visited. The pick-up was loaded up and set off. At each of the camps, the villagers had been able to erect some sort of shelter, they had built open fires and were able to cook with some rescued pots and pans. At the first camp visited the team found 3 people with broken arms and legs. Splints and bandages had already been applied, however these people had been out in the scorching heat and torrential rain for 3 days and 2 nights already with limited food and water. Many of the hospitals in Jogyakarta were already so full with earthquake victims by this time that they could no longer accept any new emergencies. 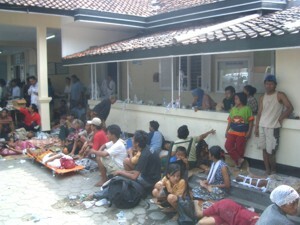 The team called around and found a hospital in Solo that was still accepting and had these people immediately evacuated to it. 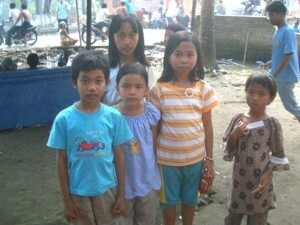 They were reached just in time and a week later returned safely to their families. The team later heard that there had been many more such victims who had not been evacuated in time, to the point that gangrene had set in. For these poor people the only option had been amputation. 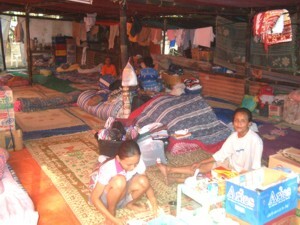 As the victims were being evacuated, the team continued the distribution process. 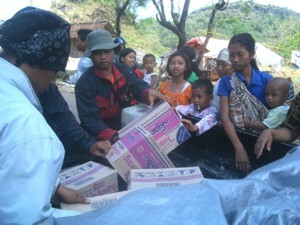 Rice, noodles, eggs, vegetables, milk, biscuits, medical supplies and tarpaulins were handed out at each location. 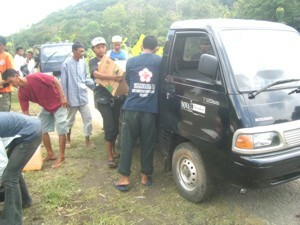 For two days the team continued to receive truck loads of provisions from Solo, and distribute these among the villages. They also compiled data from each location visited. At one camp they were told about the death of one young girl. She had been busy preparing breakfast with her mother and older sibling when the earthquake struck. As the walls and roof of their house began to shake, they had sprinted the length of their house to the outside. The mother and older sibling made it out in time, but the younger girl, who was not so fast, did not reach the door before the roof and walls collapsed in. The next evening the team again sat with the village Heads as the rains began again. One of the village Heads showed the team two old revolvers which he was carrying around with him. He first explained that, as his house was destroyed, he had no choice but to carry around his important possessions with him. Later he implied another reason. One of the villages we had not yet visited was renown for being a dangerous place. Another team of relief workers had tried to deliver provisions there. Their vehicles had been attacked and the western lady leading the team had been dragged from her vehicle. In fact this was not the only occurrence of this type of incident. Motorcycle groups were pulling alongside trucks on the road, climbing on board and taking over the vehicle with all its provisions. If villages with no provisions started attacking those with supplies, then they had to be prepared. After three days delivering provisions, the villages were stocked with enough to keep them going for at least a week. 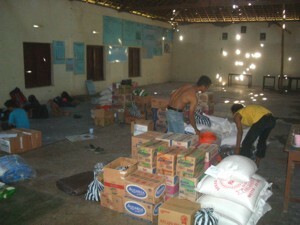 The team made arrangements with the village Heads to continue sending supplies twice weekly direct from Solo. They could now move on to a different location. 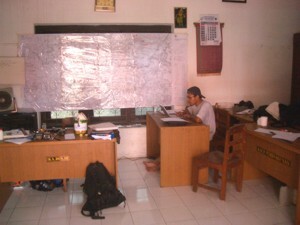 Areas of Bantul were surveyed. It was evident that now, four days after the disaster, a lot of support was beginning to arrive from local companies, the Indonesian armed forces and international relief agencies. In fact, so much so that the roads were becoming jammed up with supply trucks and vans, as well as disaster sightseers and children begging for money. The team continually received calls and sms text messages asking for help. 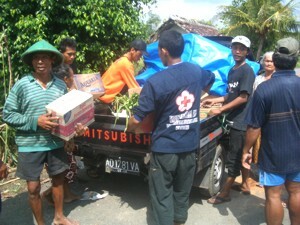 Over the following days they made single delivery drops to a number of other villages around Bantul. The name 'Bantul' had spread across the world becoming known as the center of the disaster and it was clear that all the aid agencies had headed straight there. 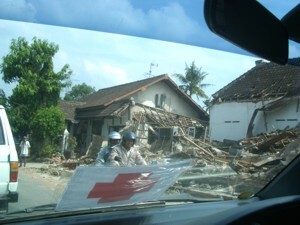 As so much support was now arriving in Bantul, the team turned their attention to the much less reported, but very badly hit, area of Klaten, to the east of Yogyakarta. 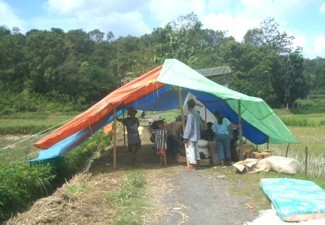 In the district of Klaten, the team made more single village drops and set up a distribution post in the village of Srajen. Then a distribution post was also established in the village of Gaden. Supplies from many other sources, both local and international, were now reaching even the remotest villages. The Foundation would now turn its attention to the issues of trauma relief and reconstruction. 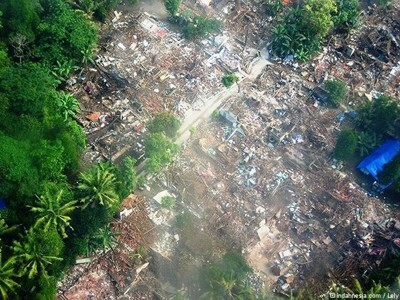 According to the Indonesian National Coordinating Board for the Management of Disaster (BAKORNAS), one month after the earthquake, the total population affected by the disaster was over 2,700,000. The number of houses that were completely destroyed was approximately 140,000 with approximately 470,000 suffering some level of earthquake damage. As reported by WHO-The World Health Organisation, the number of people who lost their lives is estimated at 6,234, with the number of injured 57,790, although the Indonesian Government is yet to reconcile the figures and produce final statistics. 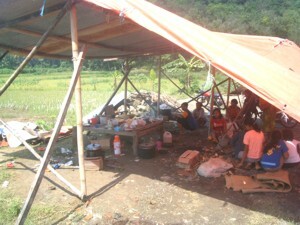 During a month, Yayasan Gunungan had distributed over 6,000 kg rice, 400 boxes of instant noodles and 60 large tents as well as significant quantities of powdered milk, drinking water, sugar, cooking oil, sleeping mats, medicine, clothes, baby food and washing materials, to approximately 10,000 people in 20 remote villages across the worst earthquake hit areas.